The average age of U.S. volunteers was 29, four years younger than the average age for Canadian volunteers. The distribution of U.S. and Canadian volunteers across age groups varied significantly. Volunteers aged seventeen to thirty accounted for 64% of U.S. contingent but only 34% of Canadians. Inversely, volunteers aged thirty-one and over accounted for 55% of Canadian volunteers and only 34% of U.S. volunteers. 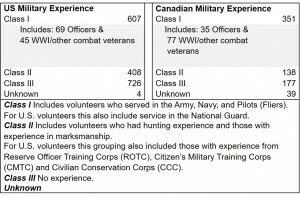 The study reinforces the common observation that Canadian volunteers as a whole were older than the U.S. volunteers (see Tables 1 and 2). NOTE: Click on the individual tables for a larger version. Table 1. U.S. 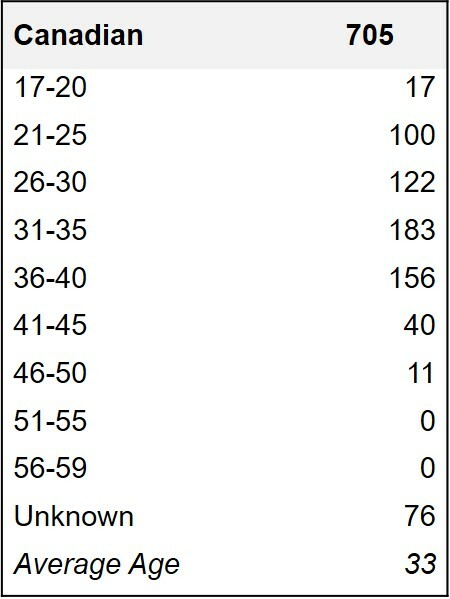 Volunteers by Age. Table 2. 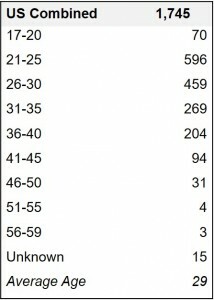 Canadian Volunteers by Age. More than half of all North American volunteers in the report claimed prior military service or some degree of familiarity with weapons. This is significant because unlike volunteers from European countries, neither Canada nor the United States relied on peacetime universal military conscription to fill the ranks of their armed forces (see Table 3). 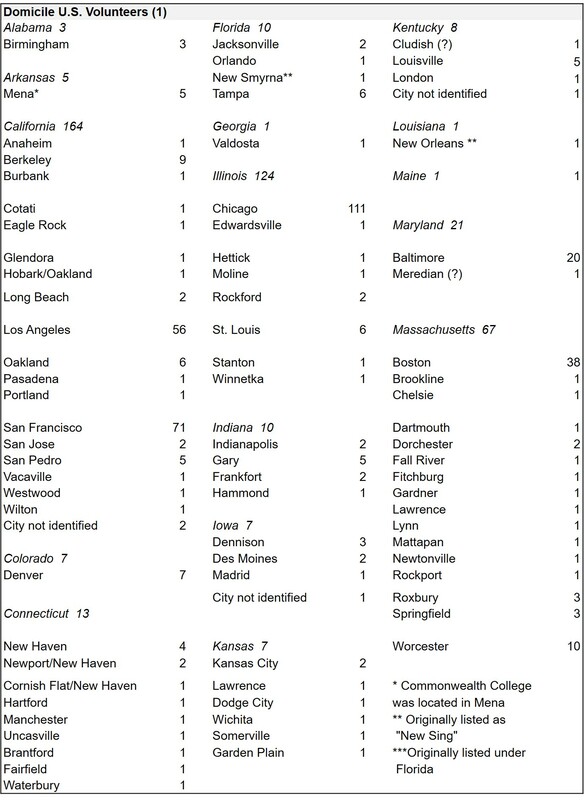 A slightly higher percentage of U.S. volunteers were listed in Class II. Class II includes volunteers who possessed applicable military skills. Twenty-three percent of U.S. volunteers were Class II whereas 20% of Canadians were. Many volunteers in both Canada and the U.S. hunted or took part in marksmanship clubs in school. Table 3. 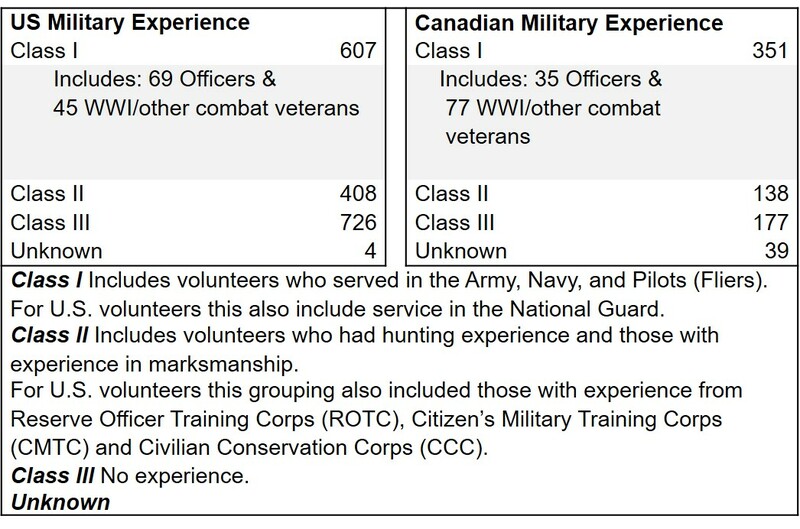 U.S. and Canadians Military Experience. 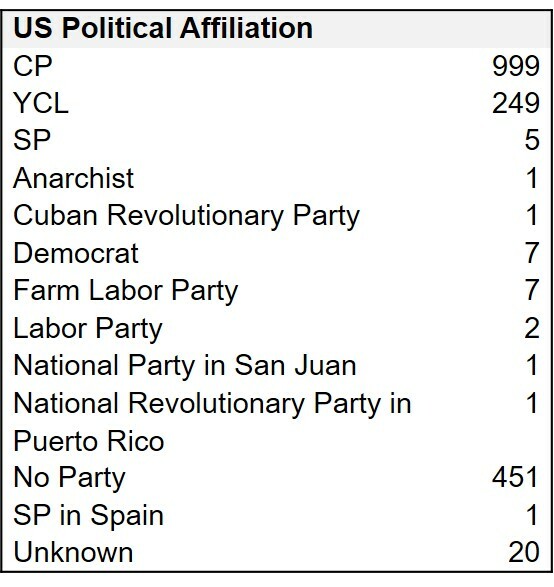 The Majority of U.S. and Canadian volunteers were members of the Communist Party (CP) or the Young Communist League (YCL). Volunteers from these organizations comprised 72% of U.S. volunteers and 55% of Canadians. 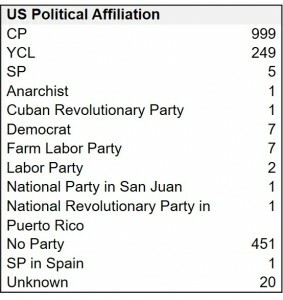 The U.S. list includes nine other political parties. The inclusion of the parties with smaller affiliations were likely included as a nod to The Popular Front coalition. A significant number, 26% of Americans and 40% Canadians, fall under the category of “No Party”. 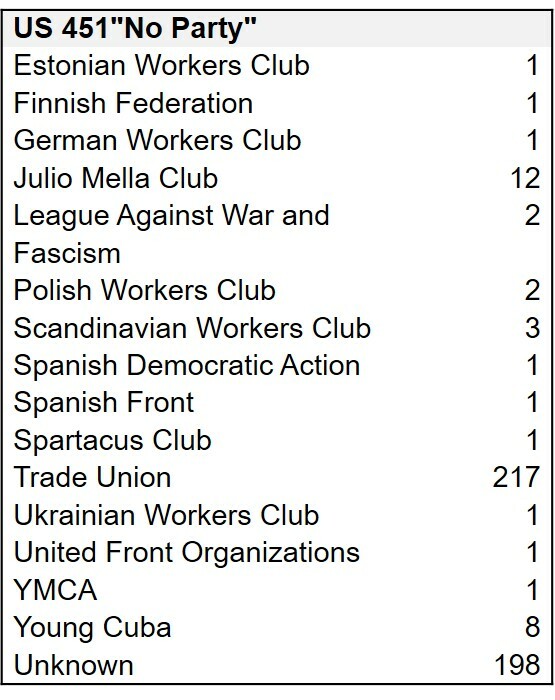 Another nod to the Popular Front was the inclusion of information regarding the volunteer’s involvement in unions or clubs for each entry under the “No Party” classification. 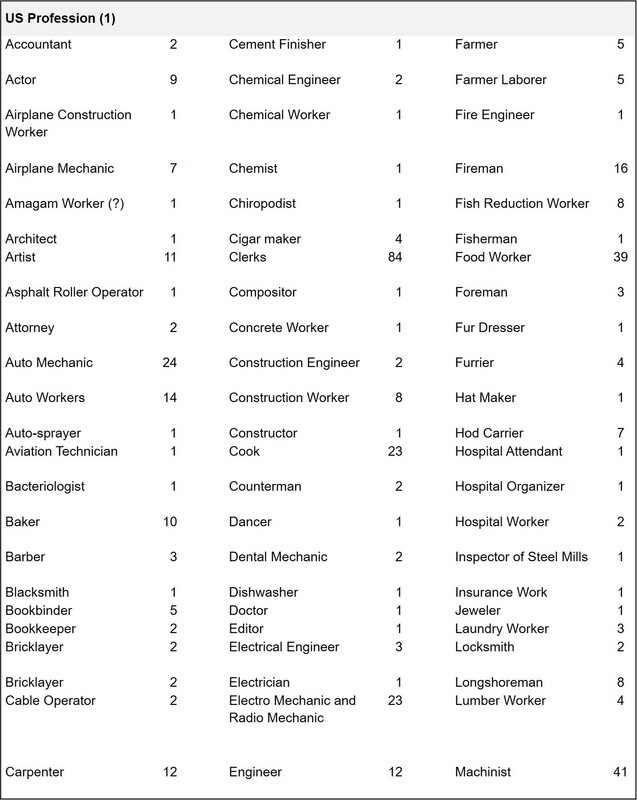 The largest representation among these classifications was trade-union membership. 48% of U.S. volunteers and 8% of Canadian volunteers are listed as union members. These numbers have a wide margin for statistical error because relevant data is missing for 44% of US volunteers and 73% of Canadian volunteers listed under “No Party” (see Tables 5 & 6). Table 5. Canadian Volunteers Political Affiliation. 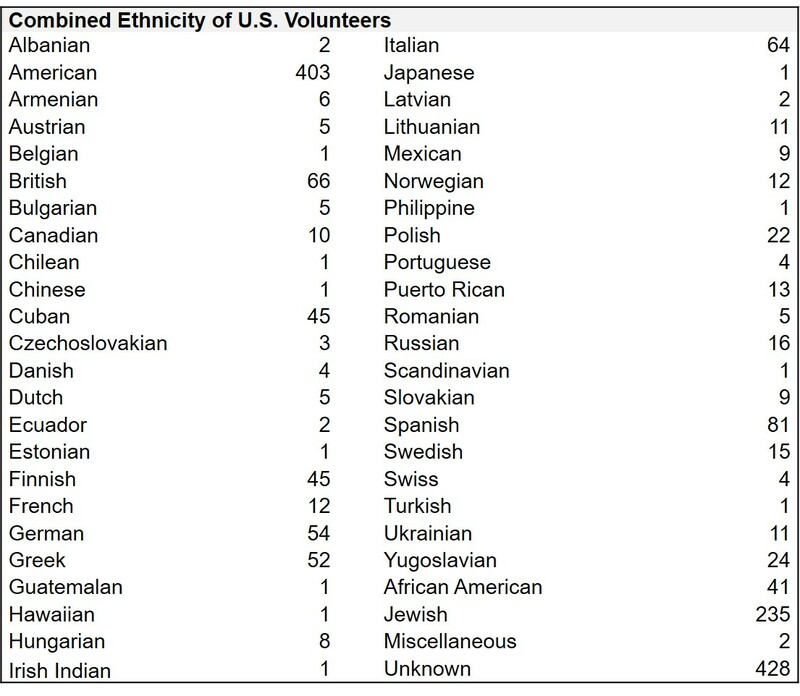 23% of U.S. volunteers self-identified their ethnicity as “American.” They represented the largest single ethnic grouping. When including African Americans among the U.S. volunteers identifying as “American,” this ethnic group grows to full-quarter of all U.S. volunteers. 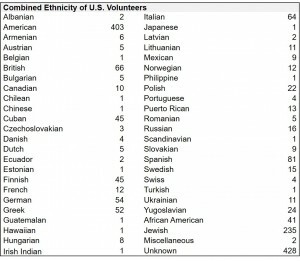 [ix] The other most frequently listed ethnic groups among the U.S. volunteers were Spanish, British, German, Greek, Finnish, and Cuban which collectively accounted for an additional 23% of U.S. volunteers (see Tables 8 and 10). 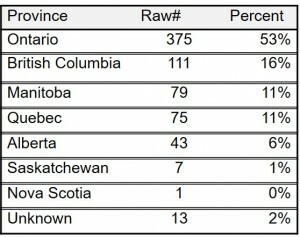 Among Canadian volunteers, only 22% were citizens. Immigrants from Britain account for 15% of the total volunteers and are the single largest ethnic group. However, if the British are broken down into subgroups of English, Irish, and Scottish volunteers they individually drop below the percentages of immigrants from some Central and Eastern Europeans. Polish volunteers accounted for 10%, closely followed by Ukrainian and Hungarian immigrants each of which represented 8% of Canadian volunteers. Finnish volunteers accounted for an additional 7%. Together these five groups of immigrants made up 48% of the Canadian volunteers. It is unusual to the modern eye to see “Jewish” listed as an ethnic grouping. Jewish appears on both the U.S. and Canadian lists. 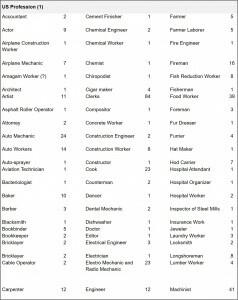 Among the U.S. volunteers 235, or 13% are listed as Jewish. [x] Far fewer Canadians are identified as Jewish volunteers. The four Jewish volunteers listed account for less than 1% of Canadian volunteers. It is likely that additional Jewish Canadian volunteers are counted as citizens or under other ethnic labels. Volunteers came from across North America. 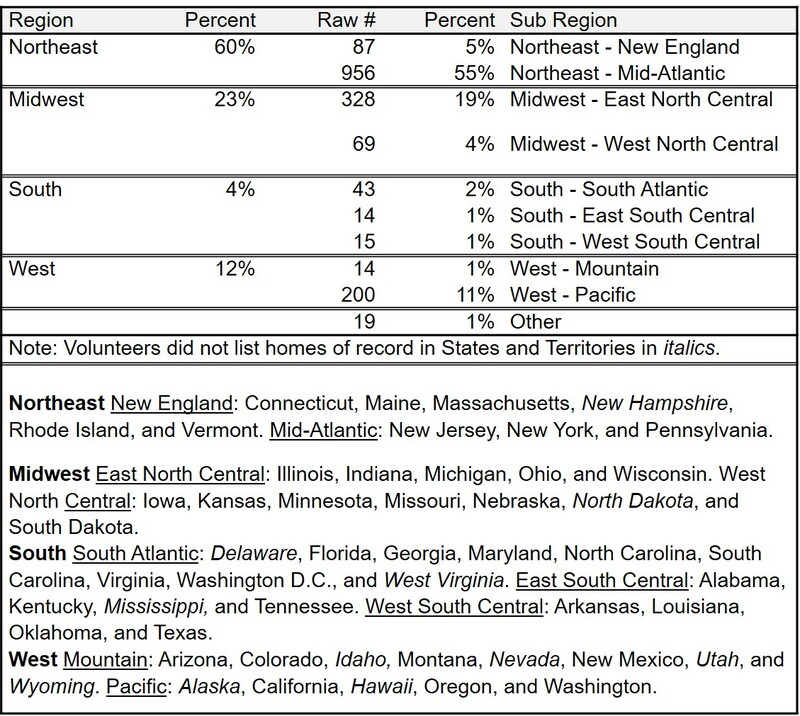 U.S. volunteers listed homes in 38 of 48 states and Canadian volunteers listed homes of record in seven of ten provinces (See Tables 15-17 for U.S. and 18 for Canadian). Most volunteers came from larger urban areas. 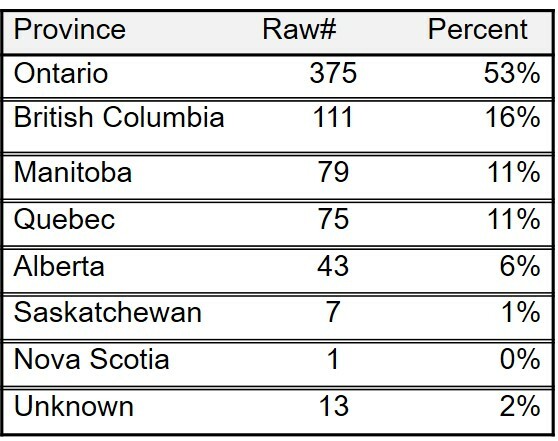 New York City in the Northeast region of the U.S. and Toronto in Canada’s Ontario Province sent their nation’s largest contingents. 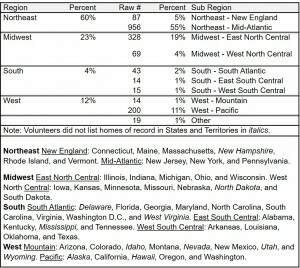 [xi] Table 12 details the geographic distribution of U.S. volunteers and Table 13 details the Canadian volunteers. Information on vocation is available for 70% of U.S. and 50% of Canadian volunteers. The compilers of the list did not attempt to group like vocations from this pool. Both U.S. and Canadian volunteers were predominately from working class backgrounds. 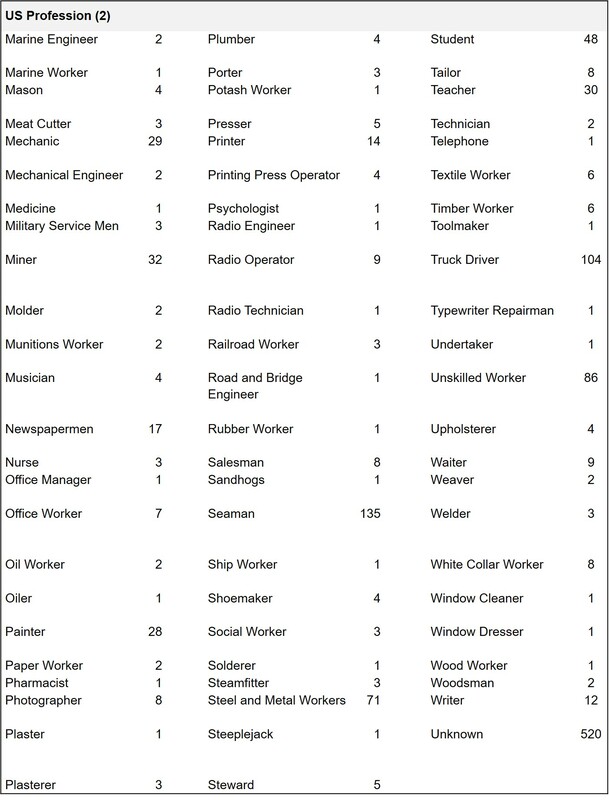 The most common vocations listed by U.S. volunteers are seaman 8% and truck driver 6%. 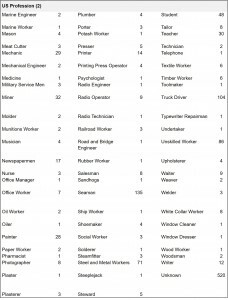 Among Canadian volunteers, the most commonly listed vocations are Laborer 11% and Miner (Gold and Coal) 8%. More U. S. volunteers identified their work as white-collar workers and professionals than Canadian volunteers did. Students accounted for 3% of U.S. volunteers but less than 1% of Canadian volunteers. 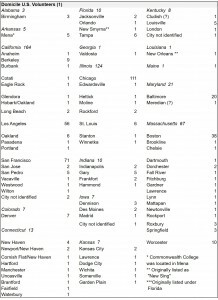 [i] General Report on 1745 People from the United States and General Report on 705 People from Canada, Российский государственный архив социально-политической истории (Russian State Archive of Socio-Political History) hereafter RGASPI, Fond 545, Opis 6, Delo 455, ll. 0081-0093. The approximate date for these undated documents is derived from comparing them to another document within the Delo, December 1936 to July 20, 1937, (ll. 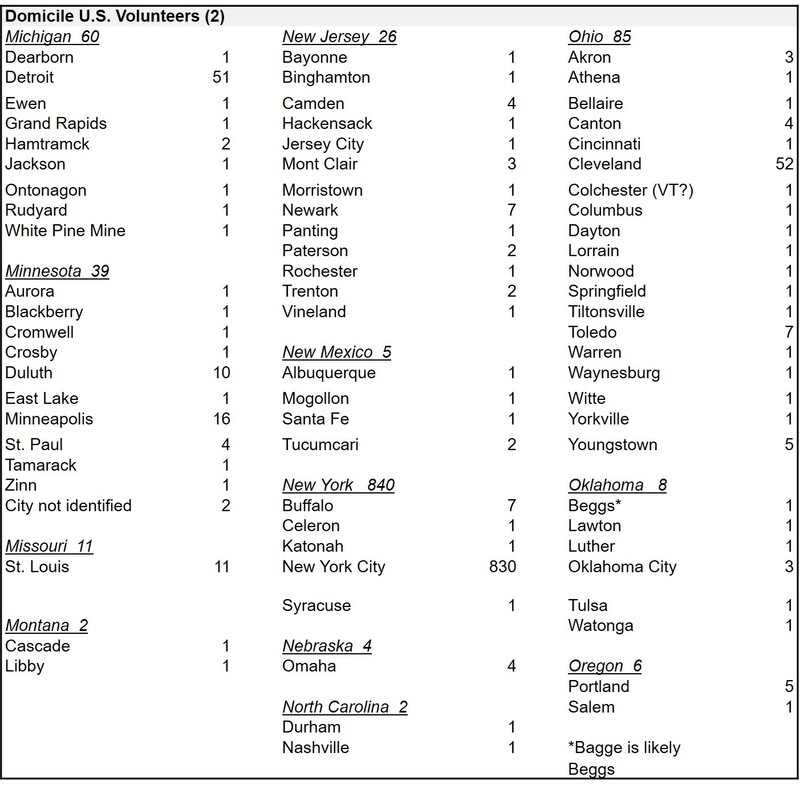 0094), a one-page list providing a breakdown of political affiliation by state for 1,741 US volunteers. Due to the similarity in numbers evaluated, it is likely that the two studies were completed during the same period. 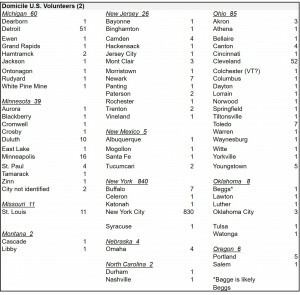 The number of US volunteers listed in December 1936 to July 20, 1937 is only four volunteers less than the number of US volunteers cited in General Report on 1745 People from the United States. [ii] American veteran Adolph Ross, in his self-published American Volunteers in the Spanish Civil War, stated approximately 2,800 American volunteers served in Spain. 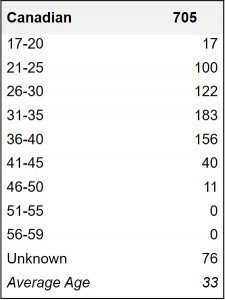 Ross’ number includes volunteers who would not have been counted in General Report on 1745 People from the United States. These include volunteers from the American Medical Bureau to Aid Spanish Democracy, volunteers for the Militia who did not transfer to the IB, and Mercenary Pilots. Dr. Michael Petrou in his study Renegades: Canadians in the Spanish Civil War identifies 1,681 Canadians volunteers. Petrou utilized Myron Momryk’s unpublished biographical dictionary of Canadian volunteers along with his own research. [iii] The supplement breaks out 420 volunteers of the 1,745 though it is not clear why the compiler considered these records significant. The source material for the compiled data is not present in Opis 6, Delo 455 nor in any other Delo thus far reviewed. 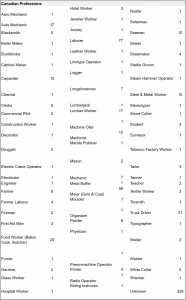 [iv] In transcribing the data, I corrected several minor spelling and cataloging errors. The data in the tables is rearranged for clarity. I placed data into alphabetic order to make it easier to locate information. [v] Canadian and American veterans of the Russian Civil War, the Finnish Civil War, and the Hungarian Revolution served in Spain. [vi] Coffman, Edward M. The Regulars: The American Army, 1898-1941, Harvard University Press, 2004. p. 235. [vii] IBID, pp. 242-244. 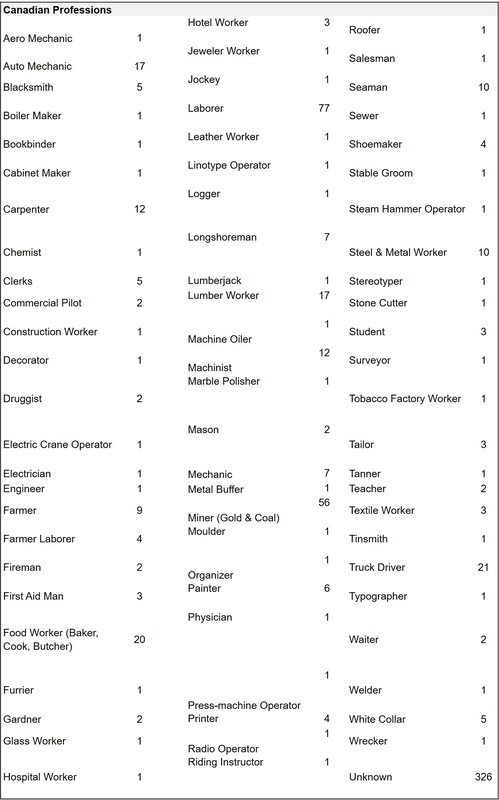 CCC gave unemployed men a chance to earn a living. Pay was $30 per month, almost double the pay of a private in the Army, to do conservation work. The men lived in barracks and worked as part of a 200 man company. 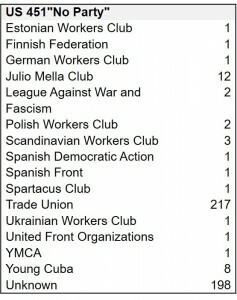 [ix] If Jewish volunteers, who are all listed as US citizens are added, the total rises to 38%. 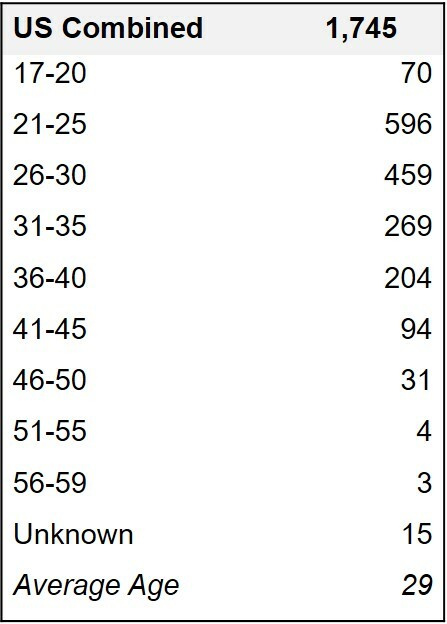 Another 24% of volunteers’ ethnicity is listed as unknown. Together these four account for 62%. [xi] Petrou Renegades, Canadians in the Spanish Civil War, Chapter 1, footnote 34 notes that some volunteers without a permanent address listed Toronto as their home of record because the Central Committee of the Canadian Communist Party was located there and they could have mail held there until their return. It is likely that some US volunteers who listed New York City as their home of record as they were recent arrivals who used a NYC address for their passport application.